Fortune Magazine published Dan Doran‘s thoughts on customer service and business value. Thanks to Mike Wood for the interview. We’ve spend a considerable amount of time over the past few months venturing into the value of craft brew industry, but what about the hub of it all…the bars in which these brewers are hoping to be placed? Liquor license: What is the current market value for this coveted license and how many are available within the local market? Ultimately, the license serves as a “floor” value regardless of profitability. Location: Is the establishment in a prime location that attracts a good crowd of both familiar faces and new patrons? Lease: What are the terms of the lease? How much time is left and what renewal rates are in place? Inventory: A bar’s inventory is purchased above and beyond the agreed upon price of the business (i.e. X times seller’s discretionary earnings PLUS inventory at cost). Opportunity to Improve Margins: Any episode of Bar Rescue will illustrate that there are numerous small tweaks that can significantly impact the bottom line such as measuring and monitoring bartender “pours”, proper pricing, hiring the right staff, improving/refreshing the facility’s appearance, and putting in place proper management, among other things. When it comes to selling your tavern/bar, proper planning and research is critical. It is best to work with your financial and business advisory team early on to assess the best ways to boost net earnings. Cheers to all of our blog readers this holiday season. Time to bulk up on some milk and cookies – or better yet, a cocktail that incorporates them both! Craft Beer Valuation: Changing Regulations Impact Value? We recently had the chance to interview Kevin Ryan with Service Brewing regarding some of the challenges facing a young upstart craft brewery. One item that piqued our interest was his comment on some of the regulatory challenges that craft brewers face in getting up and running and then growing. A quick search turns up a treasure trove of articles bemoaning how antiquated laws are stifling innovation and growth in the industry. 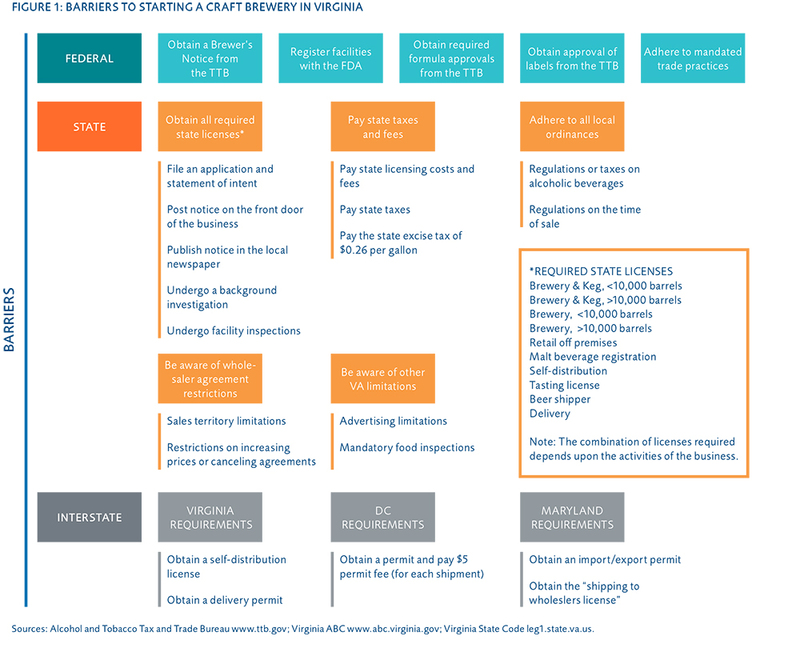 Aside: Mercatus also has a fantastic chart on Barriers to Starting a craft brewery in Virginia. We love charts and graphics… highly recommend to click through to take a look! Service Brewing is located in Georgia, but a bit further north, Governor Cuomo just signed into law a bill aimed at promoting growth in the craft brew (and more broadly, spirits) industry. Great news, right! Gov. Andrew Cuomo on Thursday signed into law a bill that relaxes several regulations to reduce fees on small manufacturers looking to increase production. The new rules will also ease rules on tastings and allow farm distilleries to operate additional retail outlets.Cuomo also announced $3 million in grants for marketing locally produced wine, beer, cider and spirits and promotion of wine trails, beer events and other tourism activities related to the state’s craft alcohol industry. So What’s the Deal with Craft Brewer Valuations? Glad you asked. And we don’t have a clear answer without looking at a specific context. We always look at factors that potentially increase or decrease a particular valuation away from the norm. For instance, a brewer in NY might now have an environment more conducive to growth than, say, a similar brewer in Virginia. More growth = higher relative value, right? Well, maybe. We’d also want to get an understanding if a more permissive regulatory environment will result in a more competitive environment with a glut of offerings. As it stands craft brewers are popping up everywhere, so the notion that the regulatory environment is stifling growth may be overblown. I’m loathe to suggest that increased regulations are healthy, but perhaps the drag that those regulations have on new market entrants is good for incumbents? Regardless, we love these scenarios. We’ve talked to a bunch of you (brewers) about real world business valuation issues for breweries. More questions? Great. Let’s talk! acscreative /wp-content/uploads/2018/11/Quantive-Logo.png acscreative2014-11-14 01:09:182014-11-14 01:09:18Craft Beer Valuation: Changing Regulations Impact Value?